BANGI, 27 November 2014 – The Pantun – the four line verses which is a hallmark of the Malays – is becoming more popular but not in the way that their ancestors designed it to be. Principal Research Fellow of the Institute of Malay World and Civilization (ATMA) at The National University of Malaysia (UKM) Professor Dr Ding Choo Ming said even the latest digital technology has been utilised to use the pantun for political campaigns, information dissemination and in business such as advertising. Delivering his discourse on Migration of People and Spread of Pantun in the Malay Archipelago, here today Prof Ding said the role of the unique form of the Malay pantun is now very different from its original purpose of expressing sorrow, joy, love or lust for revenge. 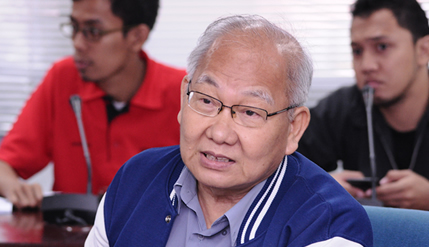 Prof Ding, however, said the increasingly literate and computer savvy people of the archipelago has changed the role of the pantun from an oral tradition to a written form adapted for commercial purposes but is lacking in the creative emotions usually attributed to verses found in traditional pantuns. “Following the loss of oral culture, the rhymes now available are in written form, shaped and even digitised. This written version has influenced the oral tradition to the extent that the memorised version is in decline. Any semblance of continuity takes the form of the written and printed version,” he said. He, however, believed that the pantun is now more important than other forms of Malay poetry such as Puisi, Gurindamand Seloka, which are not originally Malay but appeared much later in terms of chronology in the history of Malay civilization. The name Pantun is known as such in Brunei, Indonesia, Malaysia, Pattani Province, Singapore and the southern Philippines; In Java it is called Parikan, in the Sunda and other places – Sesindiran. Prof Ding said the pantun spread far and wide in the Malay world and may take the form of a series of interwoven quatrain with the same structure: there are hints and purposes, with rhymes in a b a b arrangement in the last quarter of lines 1 and 3, 2 and 4. It functioned as entertainment, education and recited during festivals and the wooing of girls or marriage proposals. The migration of Malays and the pantun with its variations have made it a valuable creative art and heritage which required genuine talent. He felt that it was not appropriate to assume that the pantuns can be found anywhere there are Malays, but he believed that in many places where there are Malays there would be variations of the pantun. It is part of the oral literature handed down and transmitted through generations. It can be found in Folklore, Comedy, Adventure stories and written works such as Hikayat Hang Tuah and the Sejarah Melayu. He said though it is still to be determined where and when the Pantun originated, he found it is interesting that there are huge volumes of such works which are found throughout the Malay world now divided into Brunei, Indonesia, Malaysia, Singapore and others territories formed by European colonialists. Prof Ding Yang who has served at UKM since 1972 is among the founders of the portal www.malaycivilization.ukm.my in 2002. His life motto is “nothing comes from nothing” and “have confidence in confidence” from the movie The Sound Of Music.